Cubs vs. Nationals at 7:30 p.m. ET & Diamondbacks vs. Dodgers at 10:30 p.m.
TBS today announced start times for Games 3-5 of the network's exclusive coverage of the National League Division Series (NLDS) presented by T-Mobile. Game times are listed below for Monday, Oct. 9, Tuesday, Oct. 10 and Thursday, Oct. 12. 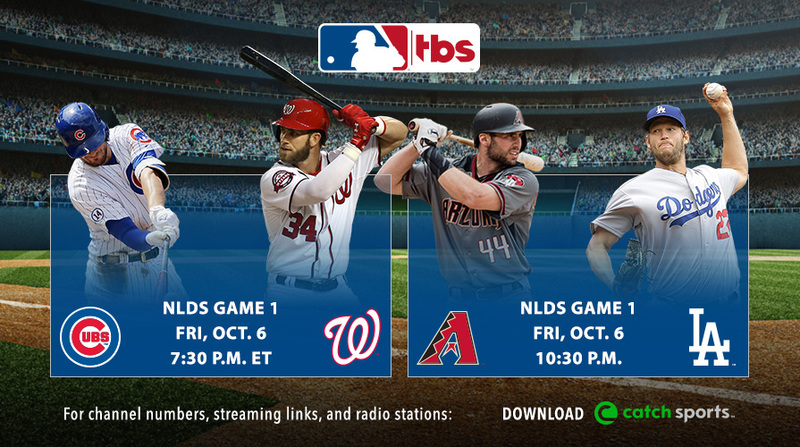 NLDS coverage on TBS will begin tonight, Friday, Oct. 6, with the MLB Postseason Pre-Game Show on TBS at 7 p.m., featuring Hall of Famer Pedro Martinez, nine-time All-Star Gary Sheffield and former NL MVP Jimmy Rollins joining host Casey Stern. The studio team will also offer postgame analysis on The MLB Postseason Show on TBS presented by the Lincoln Motor Company.